The early-age thermal development of structural mass concrete elements has a significant impact on the future durability and longevity of the elements. If the heat of hydration is not controlled, the elements may be susceptible to thermal cracking and damage from delayed ettringite formation. In the Phase I study, the research team reviewed published literature and current specifications on mass concrete. In addition, the team observed construction and reviewed thermal data from the westbound (WB) I-80 Missouri River Bridge. Finally, the researchers conducted an initial investigation of the thermal analysis software programs ConcreteWorks and 4C-Temp&Stress. The Phase II study is aimed at developing guidelines for the design and construction of mass concrete placements associated with large bridge foundations. This phase included an additional review of published literature and a more in-depth investigation of current mass concrete specifications. 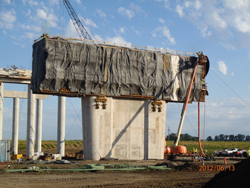 In addition, the mass concrete construction of two bridges, the WB I-80 Missouri River Bridge and the US 34 Missouri River Bridge, was documented. An investigation was conducted of the theory and application of 4C-Temp&Stress. ConcreteWorks and 4C-Temp&Stress were calibrated with thermal data recorded for the WB I-80 Missouri River Bridge and the US 34 Missouri River Bridge. ConcreteWorks and 4C-Temp&Stress were further verified by means of a sensitivity study. Finally, conclusions and recommendations were developed, as included in this report and the tech transfer summary.